Accra, Dec 15, GNA - The new Coach for the national football team, the Black Stars, Patomir Dujkovic, arrived in Accra on Tuesday. 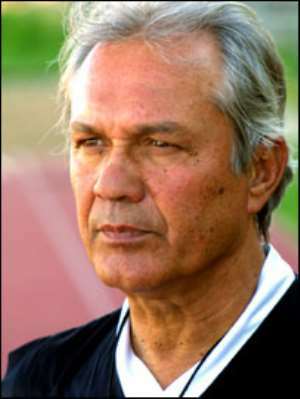 Speaking to the Ghana News Agency (GNA) the Yugoslav promised to ensure Ghana's qualification to the Word Cup in 2008. Mr Dujkovic said he was well prepared for the task ahead and was looking forward to prepare the Black Stars well for the African Nations Cup (CAN) 2008 tournament to be hosted in Ghana. The Coach with 20 years experience said his new assignment was his fourth national team experience and promised to bring his experience to bear on Ghana's fortunes in the years ahead. He said he was not new to football in Africa and identified indiscipline as one of the reasons for the decline of the game on the continent, adding that he would use tact to ensure that players gave off their best. The new Black Stars Coach noted that political and FA interference was a worldwide problem but said that he would try to bring all the groupings together positively to enhance football. Mr Alex Asante, Public Relations Officer of the Ghana Football Association and officials of the Ghana Football Association met the New Coach on arrival.